“Love Lockdown” was premiered at the 2008 VMA’s and should be available on iTunes this week. But wait the trilogy would not be complete without Jay-Z. Jay is completing a trilogy of his own with his next album The Blueprint 3. 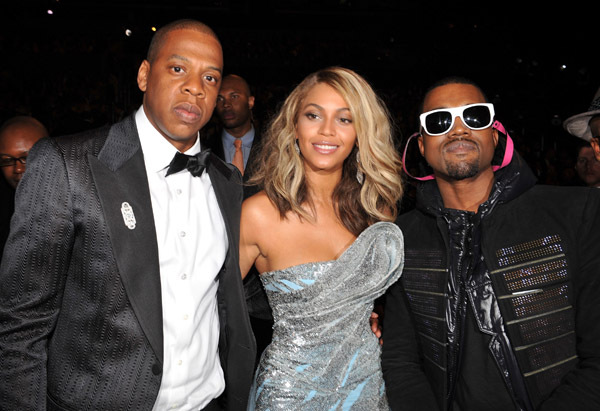 Of course the first single was produced by Kanye and “Jockin Jay-Z (Dope Boy Fresh)” was premiered on Kanye’s New York stop of the Glow In The Dark Tour. The hit single “Swagga Like Us” which features and is produced by Kanye West, will be on both T.I.‘s Paper Trail and Jay’s The Blueprint 3. Sources say that Jay-Z will be releasing his album in December or January right after Kanye’s. THIS IS A DAMN TAKEOVER! Just hearing this line up gave me chills. T.I. Featuring Jay-Z, Kanye West and Lil Wayne all on one track is crazy! The M.I.A. sample from ‘Paper Planes’ is well in other words is Simply Dope!…No word on whether this will be on T.I.’s album Paper Trail, or Jay-Z’s Blueprint 3. Just got word that the track will appear on T.I.’s album Paper Trail read about it HERE. Speaking of T.I., These two tracks are confirmed to be on the album Paper Trail which will be in stores September 30th. Usher is featured on ‘My Life,Your Entertainment’, Both tracks is definitely fiya and got me excited for T.I.’s album. Yes this is what we all have been waiting for!! Premiered first at the Madison Square Garden stop on Kanye‘s Glow in the Dark Tour, Jay-Z‘s ‘Jockin Jay-Z’ is finally here IN FULL. Produced by Kanye West who is supposedly producing the majority of BluePrint 3 which is rumored to have a December release date…what a Christmas gift! Wonder how Jay-Z feels about all this? Well he hasn’t released any type of statement yet so maybe after this album comes out he’ll start talkin…. Another edition of Dope! Sneakers this time with some of your favorite celebrities…..
First up we have Kanye West in another color way of his highly anticipated shoes the Nike Air Yeezy’s. If the shoes EVER drop expect me to have at least three pair…. Next up is Hova rocking his Reebok Pumps. The shirt is also Dope! as hell….where can i get one…. This one was hard to see….Chris Brown rocking the Retro 6’s from the Air Jordan 6/17 Countdown Package….I really wanted these but I only had room in the budget for the White/Red 23’s *sigh*…Rihanna also rockin her Converse…. And Will and Jaden Smith both had on their Jordan’s at the MTV Movie Awards. Will was rockin’ the Retro 1’s while little Jaden had on his Air Jordan Force’s 5 Fusions…definitely fresh.